The current owner purchased this Ovni 445 from new and specified her for blue water sailing. She therefore has a very comprehensive range of Raymarine navigation and communications equipment, 60 litre/hour watermaker, extra fridge capacity, additional sail/bosuns locker forward and battery charging via Silentwind 400+ wind generator, regulated solar panels and towed Aquaair100. The owner has been delighted with her in terms of sailing performance, liveaboard comfort and reliability of systems and her sale is due to a change of circumstances. She has 2 double cabins, with a single crew cabin aft stbd. Sails include 2 downwind Wingakers which were used very successfully for her Atlantic crossing and subsequent Caribbean cruising. Once on board, she struck me as fully equipped with charts for the Mediterranean, Caribbean and Pacific .... and extra-long dock lines ready for the Panama Canal. Haulout & new antifoul November 2018, plus new start battery and 2 new automatic bilge pumps early 2019. This Ovni 445 Aluminium With Lifting Keel has been personally photographed and viewed by Anita Sutton of Boatshed Grenada. Click here for contact details. Please note this comments section is public. Please do not post your personal details here. 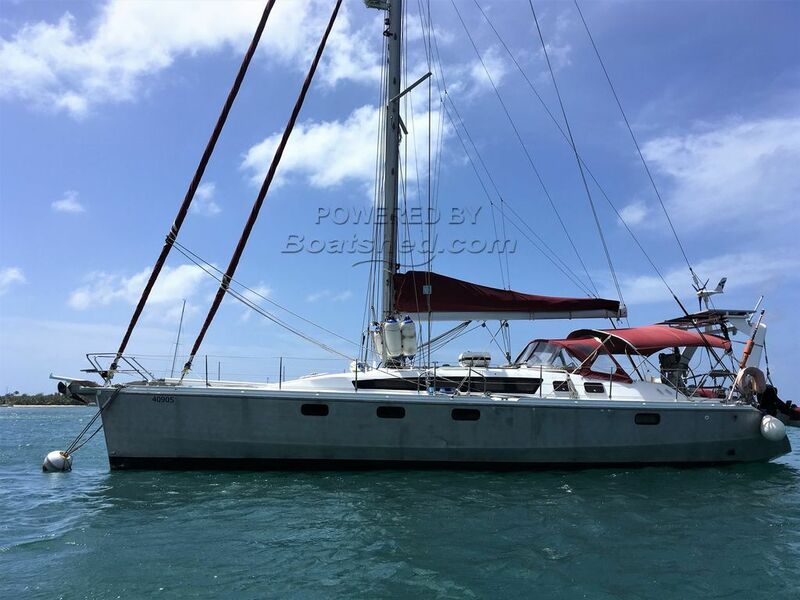 To enquire about purchasing this boat, please contact the broker directly at anita@boatshedgrenada.com. Please read our commenting guidelines before posting.